Two side cases included in the AEO2017 analysis apply alternative assumptions regarding technological advances and resource availability, which lead to very different projections for tight oil production. 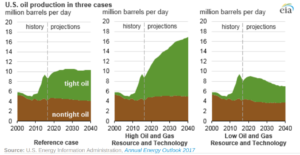 In the High Oil and Gas Resource and Technology case, which uses more optimistic technology and resource assumptions, tight oil reaches 11.0 million b/d by 2035, or 66% of total U.S. production, as higher well productivity reduces development and production costs, spurring additional resource development. 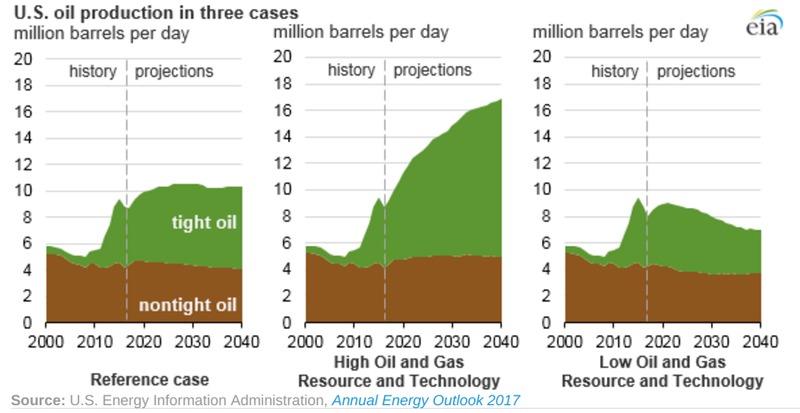 In the Low Oil and Gas Resource and Technology case, which applies more pessimistic technology and resource assumptions than in the Reference case, tight oil provides less than half of total oil production after 2030, and total U.S. oil production in 2040 is well below its current level. 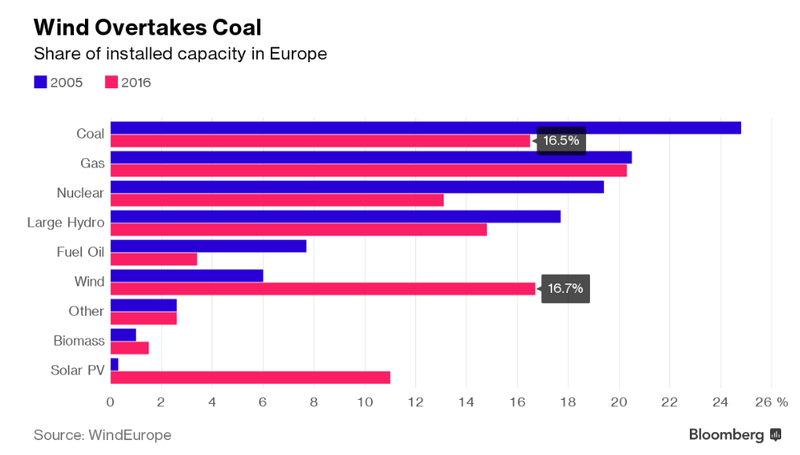 More wind power was installed than any other form of energy last year in Europe, industry figures show. European wind power grew 8%, to 153.7 GW, comprising 16.7% of installed capacity and overtaking coal as the continent’s second-biggest potential source of energy, according to figures published by the WindEurope trade group. Gas-fired generation retained the largest share of installed capacity. Meanwhile, in the U.S., a coal-burning power plant on the ropes is testing the President’s commitment to propping up the fuel as he promised. Majority owners of the Navajo Generating Station in Page, Ariz., opened in 1974 and one of the biggest coal plants in the country, said this week they won’t keep running the plant after 2019 because buying natural-gas-fired electricity is more economically sound. But the president of the Navajo Nation—whose reservation holds the plant and a coal mine — is opposing the plant’s closure and loss of 800 jobs that would likely follow. Now, he is calling on the president to keep the U.S. coal industry afloat with special treatment. While breaks and other special treatment from the government might help to subsidize the Navajo Generating Station, coal-fired power is struggling to compete with natural gas, and the coal sector’s outlook remains bleak. If Mr. Trump follows through on campaign pledges to support coal mines and plants, he would be fighting against a market reality. An abundance of low-cost natural gas, a fuel that competes directly with coal to generate electricity, has caused permanent shifts in the U.S.
“The reason we’ve had such a decline in coal? It’s not the regulations. It’s natural gas,” said Hans Daniels, chief executive of Doyle Trading Consultants, a coal market analysis firm. Since May 2013, when the last large coal-burning power plant was commissioned, 246 coal plants have been shut down in the U.S., according to federal data. Over the same period, 305 natural gas plants have opened. Mr. Begaye said he has asked the White House to help ensure the plant stays open until at least 2030 and to help the tribe develop natural-gas generators and renewable energy on tribal land. Wind turbines across the Great Plains states produced, for the first time, more than half the region’s electricity this year as a boom in wind power production is turning states in the region into renewable energy powerhouses. The power grid that supplies a corridor stretching from Montana to the Texas Panhandle was getting 52.1% of its power from wind, according to a statement from Southwest Power Pool Inc. 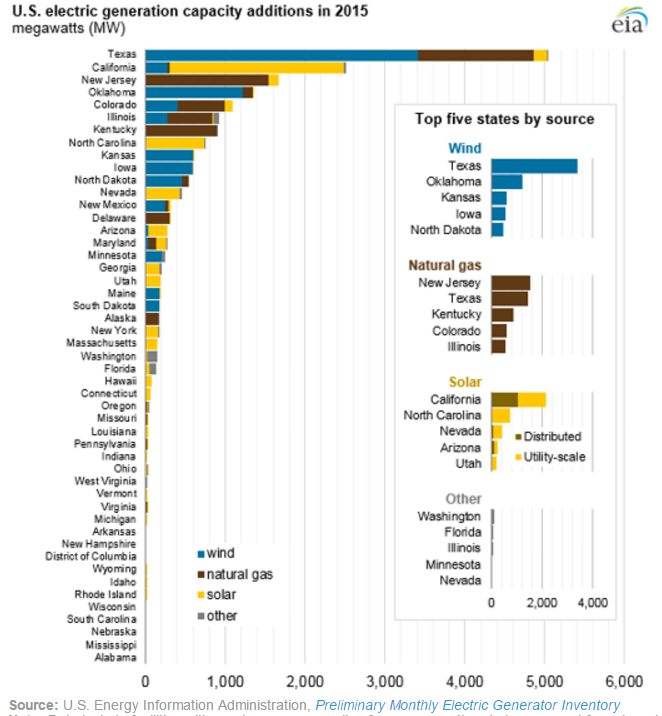 The power pool operates 60,000 miles of power grid across 14 states. Texas leads the U.S. wind industry with more than 20GW installed, followed by Iowa, Oklahoma, California and Kansas, according to the American Wind Energy Association (AWEA). In response to the growth of clean power, governors across the country are urging support for renewable energy as a means of enriching impoverished farmers, creating jobs, and increasing tax revenue.. The Governor’s Wind & Solar Energy Coalition is seeking increased federal funding to modernize local power grids and boost clean energy research, according to a letter submitted to the White House. Since November, Republican governors in Illinois and Michigan signed legislation backing wind and solar. “The nation’s wind and solar energy resources are transforming low-income rural areas in ways not seen since the passage of the Homestead Act over 150 years ago,” Kansas Republican Sam Brownback and Rhode Island Democrat Gina Raimondo wrote in the letter, on behalf of eight Republican governors and 12 Democrat state leaders. Clean power has been a boon in many rural regions. Rural property owners earn more than $245 million a year from leasing land to wind farm developers, according to the AWEA’s fourth-quarter report. Solar companies employed more than 200,000 people last year, and most new installations were in rural regions, according to the letter. The mix of fuels used to generate electricity in the United States has changed in response to differences in the expected cost of fuels and electricity-generating technology costs and their deployment. These factors, together with policies affecting emissions from power generation, will determine the generation fuel mix of the future. 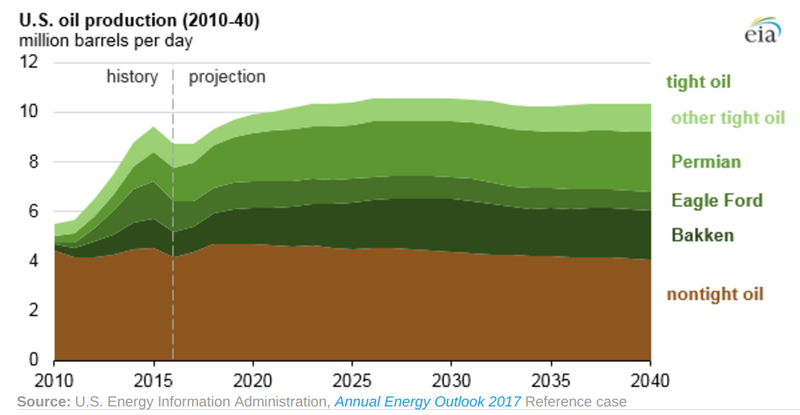 Multiple cases in EIA’s Annual Energy Outlook 2017 (AEO2017) show how projected electricity generation is affected by fuel prices, especially natural gas prices, and the Clean Power Plan, a final Environmental Protection Agency rule issued in 2015 whose enforcement was stayed by the U.S. Supreme Court in February 2016 pending the resolution of legal challenges. Without the Clean Power Plan, there is less incentive to switch from carbon-intensive coal to less carbon-intensive natural gas or carbon-free fuels such as wind and solar. 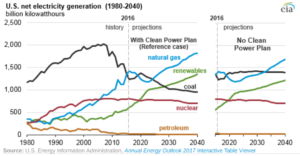 In the scenario where the Clean Power Plan is not implemented, coal again becomes the leading source of electricity generation by 2019 and retains that position through 2032, longer than in the Reference case, which includes the Clean Power Plan. 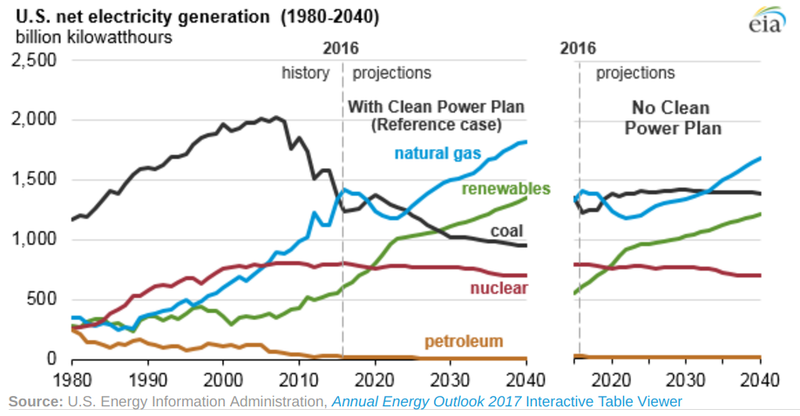 Electricity generation from renewable sources remains below coal-fired electricity generation through 2040. Fewer coal plants are retired, and as a result, natural gas and renewable capacity additions are lower compared with the Reference case. In addition to environmental regulations, the price of natural gas is an important factor in decisions about the operation, retirement, and expansion of electricity generation capacity. Of the cases included in the AEO2017, natural gas prices are lowest in the High Oil and Gas Resource and Technology case. In this case, prices remain close to their current levels through 2040, as lower extraction costs and higher resource availability result in more natural gas production. Conversely, the Low Oil and Gas Resource and Technology case assumes the opposite, and by 2040, natural gas prices return to the relatively high levels of the mid-2000s. 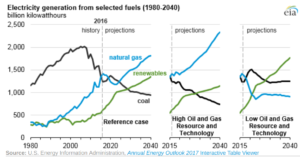 With more optimistic assumptions for natural gas supply that result in lower natural gas prices, the High Oil and Gas Resource and Technology case has more natural gas-fired electricity, displacing both coal-fired and renewable generation. Compared with the Reference case, more coal plants retire or switch to natural gas and less renewable capacity is built. 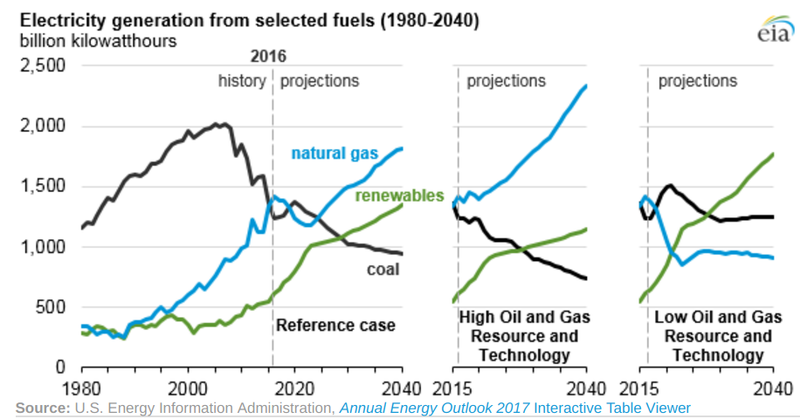 Conversely, higher natural gas prices in the Low Oil and Gas Resource and Technology case result in more electricity generation from both coal-fired and renewable plants, and coal-fired generation exceeds natural gas-fired generation through 2040. Because of higher coal-fired generation and lower natural gas-fired generation, more zero-carbon generation is required to comply with the Clean Power Plan, which is included in the Reference case that is the starting point for both Oil and Gas Resource and Technology cases. Renewables gain market share, surpassing natural gas in 2022 and surpassing coal in 2028. The Low Oil and Gas Resource and Technology case is the only scenario in AEO2017 that results in new nuclear capacity beyond what is currently under construction. Improved battery technology is about to bring electric vehicles (EVs) to the masses faster and with a greater impact than almost anyone expected. The proportion of EVs out of all cars on the world’s roads is still well below 1% with most forecasts estimating an increase in that number to around 4% by 2025. Now those estimates are looking quaint as car makers announce huge expansions in their EV production. Banks Morgan Stanley and Exane BNP Paribas now predict numbers closer to 7% and 11% of vehicles by 2025, respectively. Ford has promised 13 new electrified cars in the next five years. Volkswagen, 30 new battery-powered models by 2025, also saying that EVs will account for as much as 25% of its sales. The falling cost of batteries will make the cost of owning and running an EV the same as that of a conventional car by the early 2020s, even without subsidies. Vehicles once bought only for the sake of the environment will become the cheaper option as well. Better, cheaper batteries should also conquer “range anxiety” as pure EVs go from driving 100 miles on a single charge to more than 200. 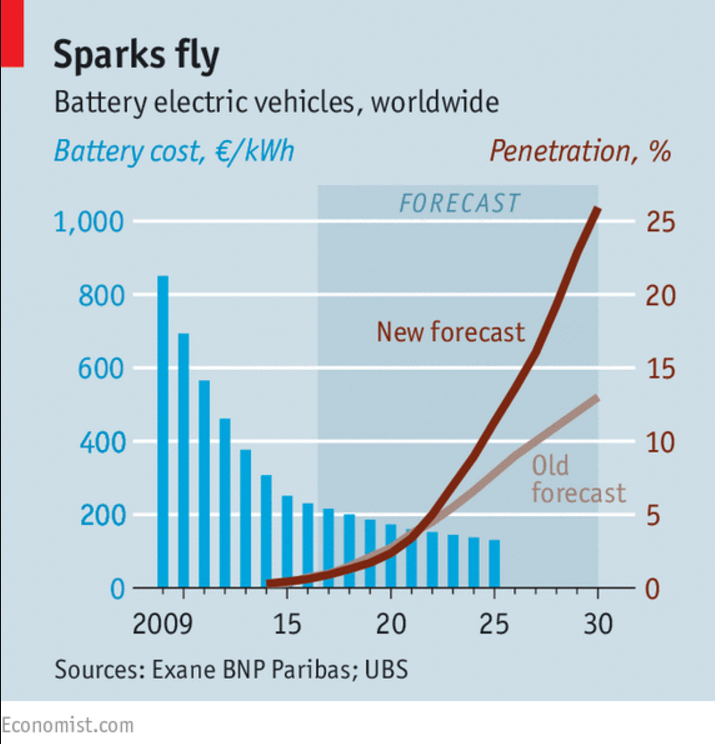 If battery technology continues to improve at the current rate, the price of a car with a range of 300 miles could hit $30,000 by the early 2020s, according to Exane BNP Paribas. In addition, better, more numerous charging points will also mean recharging in minutes, not hours, and alleviate fears of being stranded. In the U.S., the number of points grew over 25% to about 40,000 last year. 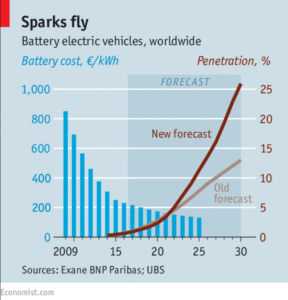 But EVs are not yet a profitable business for carmakers precisely because of their batteries. Each sale of Chevrolet’s Bolt will reportedly set GM back $9,000 and even Renault-Nissan, the biggest EV manufacturer, continues to lose money on its electric models. Research and development, as well as restructuring are also extremely expensive processes that could force many manufacturers to take multiple years of losses as they make the switch. EVs may eventually make more money than internal combustion cars as battery costs fall further and their simpler design lets companies cut labor costs, but the only thing more costly than the initial transition would be missing it altogether. If the effect of EVs on car makers will be large, their effect on oil companies will be absolutely massive. About 2 million barrels a day of oil demand could be displaced by EVs by 2025, equivalent to the mismatch of supply and demand that triggered a 50% drop in the price of oil over the past three years, according to research published by Imperial College London and the Carbon Tracker Initiative. 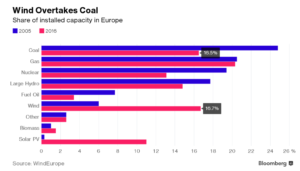 A similar 10% loss of market share caused the collapse of the U.S. coal mining industry, the report said, illustrated below in a graph from Bloomberg.com. BP says EVs could erase as much as 5 million barrels a day of global oil demand in the next 20 years, while analysts at Wood Mackenzie estimate the loss of as much as 10% of global demand over the same period. Royal Dutch Shell Plc CFO Simon Henry recently said that oil demand could peak in as little as five years. The cost of EVs is already falling faster than previously forecast; they could reach parity with conventional internal combustion vehicles by 2020, eventually saturating the passenger vehicle market by 2050, according to the report. EVs may take 19% to 21% of the road transport market by 2035, according to the researchers, or three times BP’s projection of 6% market share in 2035. By 2050, EVs would comprise 69% of the road-transport market, with conventional oil-powered cars accounting for about 13%. Considering that almost three-fourths of all oil consumed in the U.S. is used for transportation, the loss of oil-demand from cars would have a devastating impact on unprepared companies in the oil industry. Currently, EVs make up just under 1% of new vehicle sales in the U.S., half of which occur in California with its state tax incentive, infrastructure, and several pockets of high-income, socially-conscious consumers. And while Washington may be ready to roll back environmental regulations, California exerts more influence over car makers than you might expect. The largest car market in the U.S., California has its own rules mandating that zero-emission cars represent roughly 15% of sales by 2025. California has a waiver from the EPA that allows the state’s separate rules and forces auto makers to operate on the terms of California’s environmental regulators until at least 2025 when the waiver expires. California’s influence is a major reason why auto makers are developing electric cars and plug-in hybrids even though such vehicles are unpopular among buyers responding to low gas prices. The people currently buying EVs tend to buy their cars as luxury items rather than necessities. Even when prices at the pump have risen in the U.S., shoppers tend to buy cheaper, smaller cars with conventional gas engines rather than EVs. That is why, overall, the EV adoption curve in Europe has far outpaced the rate of adoption in the U.S. though hybrids have made up most of the European purchases. It is also worth noting that European life in general requires less driving as most everything is relatively close together or accessible by train. In Europe and the U.S., people make their purchases seeking to disrupt their lifestyles as little as possible. That is why plug-in hybrids that can switch to a gas engine outsell all-battery electric vehicles in Europe. And why Americans opted for cheaper, smaller cars with conventional gas engines when fuel prices started rising. For the most part, people who’ve bought EVs in the U.S. are the type of people that treat cars like luxury items rather than necessities. 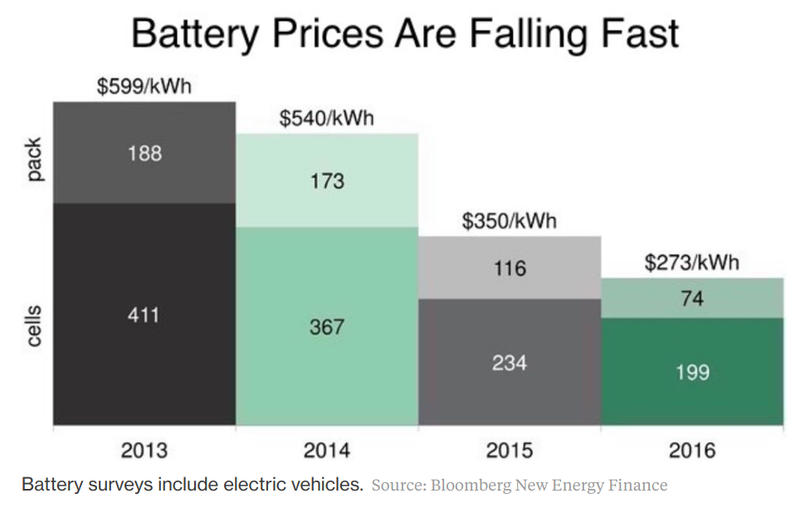 EV simply haven’t been economically viable for most; however, the economics of EVs have changed rapidly in the last few years thanks mostly to plummeting battery prices. With the price of a major component dropping by more than half in less than 5 years, all-battery electric car prices can only go down, and fast. The first electric cars with truly mass-marketable prices are coming in the very near future as Tesla begins distributing its Model 3 and the Chevy Bolt begins to hit the dealerships in earnest. Both all-battery EVs are priced at about $35,000 before tax incentives that bring the price down by thousands more. The models are also reportedly able to travel more than 215 miles on a single charge while American’s drive closer to 35 miles per day. For comparison, in 2014, the Nissan Leaf retailed at the same price with half the driving range. OPEC and Russia are leading a push by global producers to end a three-year oil surplus that sent prices crashing and devastated their finances. 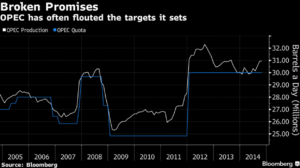 And while prices initially rallied 20% on news of the OPEC agreement, concerns about rebounding U.S. drillers will fill the gap left by OPEC’s cuts are keeping a lid on prices. Regardless of how increasing U.S. output would make ineffectual any cuts, so far OPEC member compliance with the agreement has been better than expected while compliance from non-members has been weak. Largest exporter of the group, Saudi Arabia, told OPEC that it cut oil production beyond its obligations under the deal to balance world markets, but independent review suggests otherwise. The kingdom reported that it reduced output by 717,600 barrels a day (b/d) last month, according to a monthly report from the OPEC compared to the group’s own estimates which put Saudi Arabia’s cut closer to a less impressive 496,000 b/d cut. Saudi Arabia has also violated the spirit of the deal in a more subtle way: reducing domestic use of oil so it has more to sell abroad. Saudis have always been huge consumers of oil and are only now starting to cut back. That change would allow them to export more while producing less. Oil consumption jumped 77% for Saudi Arabia between 2005 and 2015, topping even China, which grew 72%, according to data from BP. Now Saudi Arabia’s actual domestic consumption of unrefined crude oil and its increase in production left a combined 3.5 million additional barrels available for refining or export compared with 2015, according to data from the Joint Organisations Data Initiative. In regards to the group as a whole, in monthly report covering the deal, Iraq, Venezuela and Iran told OPEC they pumped more than allowed by the accord. OPEC’s “secondary sources” numbers formed the baseline for the accord. Tellingly, Iraq had initially insisted that only statistics supplied by member governments should be used. Iraq’s own data currently shows that it had made 180,000 b/d in cuts of its 210,000 b/d target. Meanwhile, OPEC said Iraq cut 166,000 barrels and the independent International Energy Agency reported that Iraq cut output by only 110,000 barrels a day. Among OPEC members, Iraq was always expected to be one of the hardest to reign in. Both the Iraqi and Venezuelan governments are currently unstable (and in need of funds) explaining their reluctance to comply with the cuts that would mean bringing in less oil revenue. Only recently seeing the end of U.S. sanctions, Iran has also made it clear from the start that righting its atrophied energy sector takes precedent over any obligations to the group. Still, estimates indicate a relatively high degree of compliance among OPEC members compared to deals in the past such as the one in 2009. According to the IEA, OPEC compliance peaked at 80% during the 2009 agreement period. OPEC, which agreed to the cuts with 11 other oil-producing nations in December, is 92% compliant with its pledge to reduce output by 1.2 million b/d, Oil Minister Essam Al-Marzooq told reporters Monday in Kuwait City. 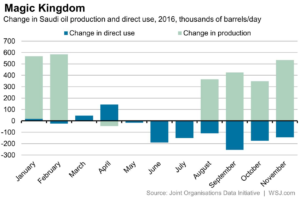 Non-OPEC producers are complying at a lower rate, he said. The IEA reported similar numbers showing a historically high 90% compliance rate. The same cannot be said for the 11 non-OPEC producers that agreed to join in with output cuts. Compliance from OPEC members alone was never going to be enough to balance the market. If it were, then the group wouldn’t have had to ask other producers to join the agreement and cut their output by 558,000 b/d. So far, Russia and the other non-OPEC participants have cut just 269,000 b/d, according to IEA data, or compliance of about 48%. Kuwaiti Oil Minister Essam Al-Marzooq, whose country chairs the committee that oversees compliance, is urging those countries to fulfill their commitments; however, those urgings are probably in vain since OPEC has no means of compelling compliance in any meaningful way. 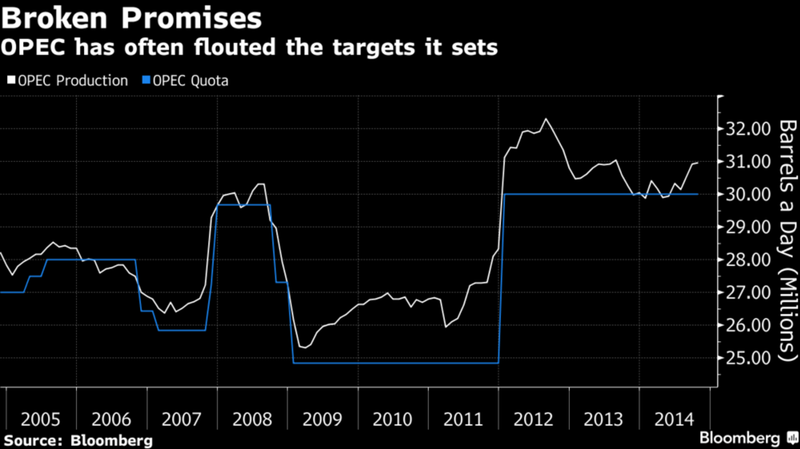 In addition, the output deal expires in June and though OPEC members have said they will consider extending the cuts if necessary, non-OPEC members have not even suggested they might go along with an extension. With all the trouble, the oil market is still far from being back in balance. If the organization keeps output at January levels, supply would still outmatch demand by about 800,000 a day adding to already bulging global stockpiles. If members of Congress and the new President are really dedicated to wringing more jobs out the energy sector, then they should make sure they’re looking for them in the right place. Since oil prices collapsed in 2014, Bloomberg estimates that 440,000 jobs in the U.S. have been lost as a result of the downturn. As a result, the world’s biggest oil services companies have had to spend billions on severance costs and, now, few seem ready to risk a repeat of that huge expense. Many in the oil industry are increasingly turning to automation to replace many of the lost jobs, a trend unlikely to change as technology costs continue to fall relative to wages. The UBS estimates that the US oil industry will only need about half as many workers per barrel of oil produced post-2017 versus pre-2015. 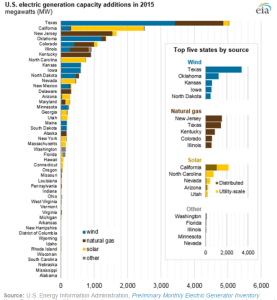 That doesn’t necessarily mean that states known for oil output are heading for high unemployment rates. For example, Texas may have suffered greatly during the 1980’s oil price downturn, but its economy has since become far less dependent on the commodity thanks to strong growth in other sectors. In fact, Texas has had net creation of new jobs recently despite the severe oil price downturn. Only about 2.5% of Texas’ employment was related to natural resource extraction before the crisis because oil was and increasingly is not a particularly labor intensive industry. Even now Austin and Dallas are thriving with job growth rates of 4.3% and 4.2% respectively because neither city is dependent on oil prices to drive economic growth. Overall, the biggest oil producing state in the U.S. has held together just fine despite the lower-for-longer oil prices. Meanwhile, large number of new energy jobs are coming from the wind and solar energy industries. U.S. wind-farm developers and suppliers had more than 100,000 workers at the end of the year, compared to 65,971 coal mining jobs at the start of last year, according to the U.S. Energy Department. Perhaps surprisingly, the top 10 congressional districts for wind energy are all in Republican-dominated red states such as Iowa and Texas, according to American Wind Energy Association CEO Tom Kiernan. And the extension of two key federal tax credits by the Republican-controlled Congress at the end of 2015 along with the fact that the new Energy Secretary, Rick Perry, saw Texas become the largest producer of wind power during his term as Governor gives some cause for optimism in the renewable energy companies. 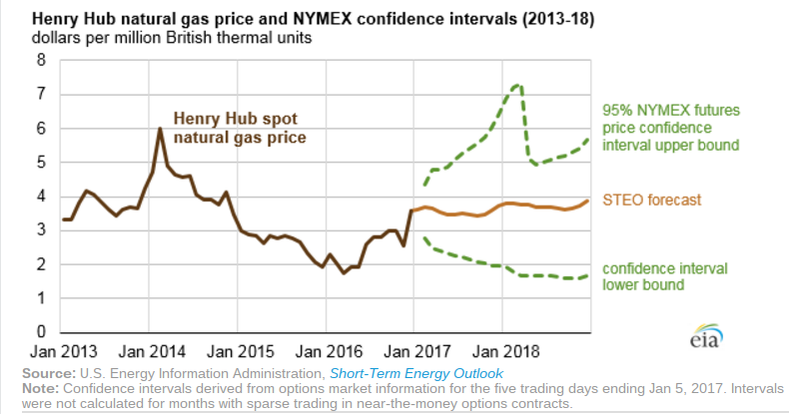 In its January 2017 Short-Term Energy Outlook (STEO), the EIA expects the Henry Hub natural gas spot price to average $3.55 per million British thermal units (MMBtu) in 2017 and $3.73/MMBtu in 2018, both higher than the 2016 average of $2.51/MMBtu. 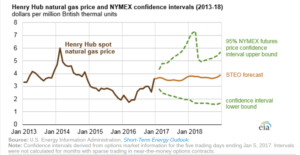 The confidence interval range for natural gas prices is a market-derived range that reflecting trading on futures, not supply and demand estimates. The EIA expects natural gas consumption to rise based on a return to more typical winter temperatures, while use of natural gas for electric power generation is expected to decline because of higher fuel prices. 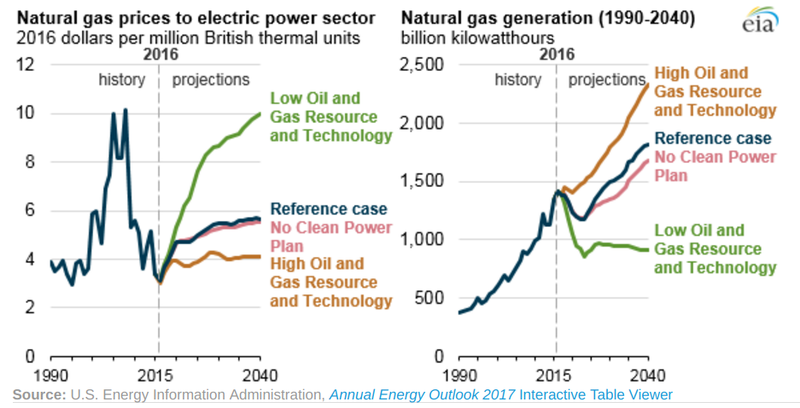 Natural gas-fired power generation is forecast to rise in 2018, but remain below the 2016 level. Current plans for additions show 11.2 GW in 2017 and 25.4 GW in 2018, equating to an overall increase of 8% from the total capacity existing at the end of 2016. The expansion of natural gas-fired capacity follows five years of net reductions of total coal-fired capacity. Available coal-fired capacity fell by an estimated 47.2 GW between the end of 2011 and the end of 2016, equivalent to a 15% reduction. 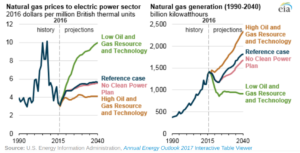 The electricity industry has been retiring some coal-fired generators and converting others to run on natural gas in response to environmental regulations, as well as low cost of natural gas resulting from expanded production from shale formations. Many of the natural gas-fired power plants currently under construction are located near major natural gas shale plays or pipeline networks. Rising natural gas prices could lead developers to postpone or cancel some planned projects, or reduce the capacity used in existing plants. Despite the additions to capacity in 2017, the STEO forecasted share of total U.S. generation supplied by natural gas falls from 34% in 2016 to 32% in 2017. 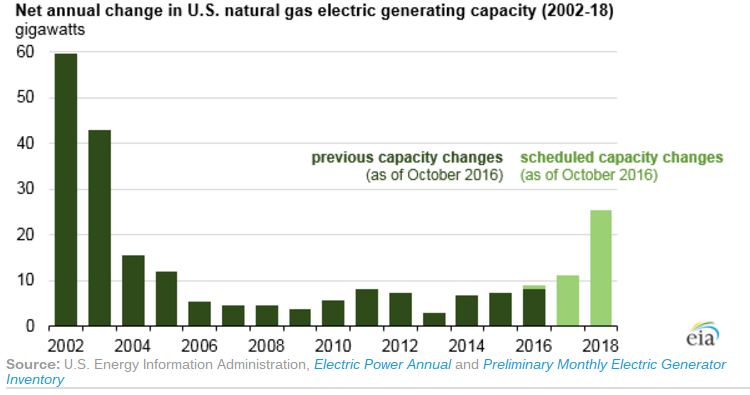 By 2018, however, the scheduled expansion of overall capacity fueled by natural gas is expected to result in a slight increase in natural gas’s share of total U.S. electricity generation despite other factors. OPEC members seem committed to showing commitment to their deal for whatever that’s worth. In OPEC’s initial agreement, production data compiled by analysts in the group’s secretariat will be the principal tool for judging whether members are complying with the deal. Notably, the data won’t cover non-members such as Russia. The committee also has no plans to use external agencies to verify implementation of the pledged supply curbs. Still, non-official channels are happy to keep track for them. Tanker-tracker Petro-Logistics SA estimates that oil supplies from OPEC plunged in January in one of the first outside assessments of compliance. OPEC will reduce supply by 900,000 barrels a day in January, about 75% of the cut that the producer group agreed, according the Geneva-based consultant group. The data suggests “a high level of compliance thus far into the production curtailment agreement,” said Daniel Gerber, CEO of Petro-Logistics. An implementation rate of 75% is high relative to past deals such as the 2008 deal where it only reached 70%, according to Hasan Qabazard, OPEC’s former head of research. For now, there’s no indication that the cuts will need to be extended beyond the initial six-month term, Algeria’s representative Boutarfa said at a recent meeting, echoing previous comments by the Saudi oil minister. Unfortunately for OPEC, six months of cuts may do little to move prices. The U.S. rig count has been rising and, with a looming resurgence in U.S. output, analysts have their doubts about the efficacy of the OPEC agreement and any future deals the group could make. As the capacity for oil production in the U.S. rises and global demand for oil falls, the group’s power over the market is a fraction of what it once was during the 1973 Oil Embargo and resulting crisis. The latest energy outlook by supermajor BP illustrates the market-share/price problem facing OPEC. BP’s Energy Outlook 2017 estimates that there is an abundance of oil resources, and “known resources today dwarf the world’s likely consumption of oil out to 2050 and beyond”. BP expects oil demand growth to slow down in the years to come and pegs the cumulative oil demand until 2035 at around 700 billion barrels, “significantly less than recoverable oil in the Middle East alone”. In this view, low-cost producers — primarily OPEC nations and Russia — would try to seize more market share. BP predicts that the abundance of oil resources would prompt the lowest-cost producers to pump the low-cost barrels as quickly as possible before demand falls off. However, OPEC has the recent experience of oil prices crashing weighing on it. After attempting to force high-cost shale drillers out of the market and seeing the resulting drop in oil revenue OPEC appears reluctant to return to a market-share strategy. But OPEC’s decision to cut supply is currently benefiting U.S. shale putting the cartel in a lose-lose situation.